The Little House of Concrete Bookshelves: Maya Jasanoff "Liberty’s Exiles: The Loss of America and the Remaking of the British Empire"
Maya Jasanoff "Liberty’s Exiles: The Loss of America and the Remaking of the British Empire"
Since my year studying Problems in Australian History back in 1971 I've been interested in the reasons behind the British colonisation of Australia and a cursory glance at this title sitting in the Recent Arrivals section of the local library suggested I might find something of interest herein. 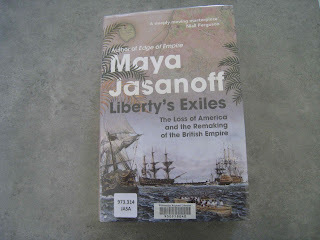 As it turned out, there's nothing much that links the Loyalist refugees to Australia's First Fleet, but it was definitely an interesting read. History tends to be written by the winners, and the conventional wisdom of American history probably leans towards Republican Revolutionary victory rather than Loyalist courage in the face of defeat, so over the years it has been difficult to avoid an impression of patriotic revolutionaries against despotic Red-coated tyranny. I have memories from childhood of a Walt Disney TV series called The Swamp Fox starring Leslie Nielsen as Revolutionary War hero Francis Marion. In that sort of setting you're not going to find too many references to the fact that when the British evacuated New York and other cities in November 1783 they took 75,000 civilian refugees with them. At the start of the struggle as many as one-quarter of colonists had been inclined towards loyalty to Britain rather than the Continental Congress. Seven years of struggle and forced persuasion reduced that support significantly, but there was still a substantial Loyalist rump willing to go into exile, largely to Canada, the Bahamas and Jamaica with some venturing as far as Sierra Leone, the venture that had lead me to expect there just might be something related to Australia's First Fleet contained herein. As it turned out, there wasn't a great deal, although one of the earliest suggestions of Botany Bay as a site for British settlement came from Loyalist James Matra, who'd been an able seaman on Cook's voyage that called there in 1770. This account, based on extensive research through the archives of all the major Loyalist destinations and the records of the Loyalist Claims Commission, set up to compensate the refugees for their losses and reward their fidelity to the crown provides what could well be the definitive history of the Loyalist diaspora around the Atlantic. Loyalists, the reader learns, came from most classes and ethnicities, including Creek and Mohawk leaders looking to protect their communities against American expansionism and included Mayflower descendants alongside recent immigrants, Anglican clerics with Methodist preachers and Quaker practitioners, back country farmers from the Carolinas and urban sophisticates from New York and Boston, colonial administrators beside butchers, bakers and candlestick makers and Benjamin Franklin’s son William. Loyalists opposed revolutionary anarchy, the Boston Tea Party’s fancy-dressed hooliganism, mob-rule tar and feathers. They saw those Boston merchants groaning about taxation as ingrates unwilling to contribute to the coffers after British taxpayers had protected their interests through the French and Indian War while paying, on average, one-fiftieth of the impost on British residents. Around sixty thousand Loyalists departed for exile, at least eight thousand of them free blacks, with an additional fifteen thousand slaves added to the exodus. Their descendants played a significant role in the British expansion in India (Benedict Arnold’s sons), and with Sierra Leone's Freetown founded by 1,200 black Loyalists literally on the doorstep of a major slave trading depot. The fate of the blacks, both free men and slaves makes for particularly interesting reading, with many of them finding their way to Nova Scotia rather than more obvious destinations like the Bahamas or Jamaica. The difficulties slave owning Loyalists experienced in Britain's largest Caribbean colony are also explored against a backdrop of slave rebellions in Santo Domingo. An interesting read, though it didn't deliver what I'd been looking for when I started reading, which is, in its own way, a significant recommendation since I kept ploughing through a hefty volume when I could have been shooting it straight back to the Library.